The War on Terror. Global warming. Iraq. Palestine. WMDs. MAD. Earthquakes. Famines. Katrina. Tsunami. Chaos, catastrophes and calamities. The world's a sad, sad place. Yet in spite of all of this, be at peace and be encouraged because Jesus is in charge and He's coming back. I don't mean to trivialize any human suffering. Read Luke 21:5-38 and think about what Jesus has predicted will happen. As you thoughtfully read this chapter, what discourages you? What do you see that gives you hope? 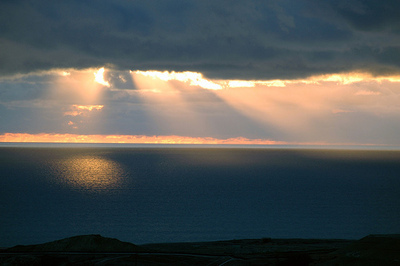 How should you and I respond to Jesus' prophecy of his second coming? The bottom line is this: the human race cannot destroy itself and this planet. The End will occur when Jesus returns. Until then we must work for peace and justice and protect the environment as stewards of God. But remember that we cannot annihilate ourselves into extinction. What a feeling of relief when we know we've been forgiven! Now what are we supposed to do? Think about how various people reacted to Jesus healing the paralyzed man in Luke 5:24-26. 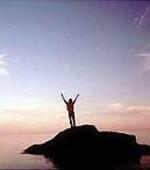 Why did the man continually praise God? What was he grateful for? Do you think fully realized that he had been not just healed but also forgiven? Notice Luke’s colorful language to describe the crowd’s response: “amazement took them all” (literal translation). What did the crowd of onlookers say? How did they respond? Why were they afraid? Compare Colossians 1:10-14 and Ephesians 4:31-32. How should Christians respond when we know that we have been forgiven? Forgiveness inspires worship and more forgiveness. Pass it on. Jesus calls himself “the Son of Man” in Luke 5:24. Compare Daniel 7:13-14. What do you think is the significance of this title Jesus uses for himself? Notice that Jesus claims as the Son of Man to have authority on the earth among human beings to forgive sins. Compare these other passages in Luke’s gospel (a few of the many) where Jesus calls himself “the Son of Man” –- Luke 6:5, 12:8-10, 12:40, 18:31, 19:10, 21:27-28, 22:67-71. You can see that “Son of Man” was a favorite title Jesus used for himself. What do you think the religious leaders understood Jesus to mean when He called himself “the Son of Man”? What do you think Jesus himself meant when He said He was “the Son of Man”? “Son of Man” was a term that both revealed and concealed that He was and is the Messiah. He used it in reference to his earthly ministry, his suffering, and his glorious return. As the Son of Man, Jesus is indeed a man – the Unique Man – through whom God is now working. Luke 1:77 – What can one receive if one is forgiven? Luke 3:3 – Before there can be forgiveness, what must take place first? Acts 10:43– What is the Source of forgiveness of sins? Isaiah 43:25 – Who is the true Forgiver of sins? Does he have to forgive us? Compare Jesus forgiving the paralyzed man to another story of His offering forgiveness, found in Luke 7:36-50. Jesus declared her sins forgiven, no strings attached. Like this sinful woman, the paraplegic received God’s forgiveness because he repented and believed. Jesus released him from his moral and legal obligation due to his sinning. In Luke 23:23 Jesus makes it clear that all human beings need forgiveness, and his death on the cross makes that possible. How can we know that our sins have been forgiven? For starters, we can focus our attention on Luke 5:20- 26 and think about the struggle between Jesus and the religious leaders. What is blasphemy? Why did the Pharisees and teachers of the Law accuse Jesus of blasphemy? If the religious leaders did not make this accusation verbally, how did Jesus know about it? Some Bible teachers call this the first miracle of the story. How did Christ answer the religious leaders’ unspoken complaint? What does this say about Jesus? Obviously it is easier to tell someone that his or her sins have been forgiven; no one would ever know since we cannot see it happen. But to command someone paralyzed to stand up and walk, that’s another story. We would know immediately if it happened or not. That’s Jesus’ point when he turns to the paraplegic and orders him to stand, pick up his stretcher, and walk home. What happened when Jesus told the man to do this? How did the man react? How did the crowd of spectators respond? If Jesus could command the man to be healed, what does this imply about his ability to forgive him? Sometimes we need the help of others to overcome spiritual obstacles. The paraplegic that Jesus healed benefited from the help of his friends. Read all about it in Luke 5:17-26. At the time of this miracle Jesus was in Capernaum, and religious leaders had come from all across Israel to hear Him teach. The Pharisees were a separatist sect within Judaism which sought to keep the Law of Moses as carefully as possible. They separated themselves from the common people and devoted themselves to their understanding of holy living. The "teachers of the Law" were lawyers and scholars who were experts on the details of what it said. Why do you think they were with Jesus? What do you think they were looking for? Jesus was speaking with these officials in a house when a paralyzed man was brought for healing. Why couldn’t the paralytic and his friends carrying him get closer to Jesus? What did the paralyzed man and his friends do when hindered by the crowds around Jesus? Archaeologists and historians who have examined house construction practices in first-century Palestine have concluded that the men most likely climbed a set of stairs attached to one of the outside walls of the house to get to its roof. They then proceeded to dig through a thin layer of cement in order to pry up limestone slabs supported by stone arches underneath. Once enough of these tiles were removed to make a large hole, they lowered the paralytic down right in front of Jesus. There was no way Jesus would fail to see their needy friend! Have you ever felt like other people were blocking you from being near Jesus? What do you think the paralyzed man and his friends’ example of persistence teaches you and me about our need to get closer to the Lord? Can you or I blame anyone or anything if we're not as close to Jesus as we need to be? Who could help you draw closer to Jesus? Who needs your help to overcome sin in his or her life? This week on the Bible Blog we’re going to focus our attention on finding forgiveness through Jesus Christ. 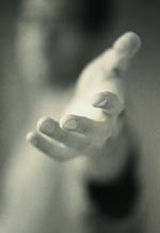 He is the Source of God’s forgiveness here on earth since He has the right and power to forgive anyone who comes to Him. The basis of our study will be Luke 5:17-26, the story of Jesus healing a paralyzed man. Take the time to read this familiar account and think about the following questions: Why were the Pharisees and teachers of the law angry with Jesus’ claim to forgive the man’s sin? How did the Lord demonstrate his authority to grant forgiveness? Why do you think Jesus called attention to the paralytic’s sin when he needed physical healing? The paralyzed man suffered from a medical condition that obstructed his ability to walk. Perhaps he had been born that way, or lost his mobility through disease or injury. Regardless, his situation was chronic. Dr. Luke notes that he cannot walk or stand on his own. His legs are too weak, so he must lie down and be carried by others if he wants to move about. There was no way this man can get to Jesus on his own, so he needs the help of his friends to carry his stretcher. He was dependent on the kindness and strength of his friends to help him get around. Thankfully, he and his friends trusted that Jesus could heal him. While I think we need to be careful to not overly spiritualize the man's paralysis and blame it on sin, I do think we can understand it as a picture of our true spiritual condition as sinners. We are powerless on our own to help ourselves. We desperately need the forgiveness that Jesus offers. Would you confess your sins online? Millions of people are doing just that according to this post from the San Antonio Express-News online edition. The nagging question is, does confessing your sins mean you have been forgiven? How does one know that he or she has been forgiven? Read Luke 5:17-26 and think about the relationship between faith and forgiveness. Consider these questions: Who is Jesus claiming to be by forgiving the man’s sins? 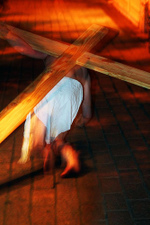 Why do you think Jesus focused on the paralyzed man's sins? Who do you identify with in this story?...the crowd?...the paralyzed man?...the friends who carried his stretcher?...the Pharisees? Why? Doctors caution us about eating too much salt. But what are the benefits of salt? Read carefully Jesus' warning in Luke 14:34-35 several times. He's emphasizing that salt is good and useful. Besides adding flavor to our food, what else is salt good for? Scholars have debated how salt can or cannot lose its saltiness. It seems best to understand Jesus as referring to the common salt in ancient Palestine that was derived from the evaporation of the Dead Sea. It had impurities such as carnellite and gypsum mixed in with it, and once the salt dissolved out, the remainder tasted bitter. What good is salt that has lost its saltiness? What do people do with it? Compare Matthew 5:13. 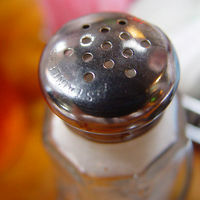 Consider this: Where do Christians get their saltiness? What happens if the followers of Jesus are half-hearted in their commitment to Him? How would that impact their world? Sometimes Christians aren't very salty; they create little thirst for Jesus and his gospel. In fact, by their hypocrisy and lack of love, they might be really good at raising the blood pressure of watching unbelievers, but not at arrousing their interest in Jesus. Such half-hearted Christians don't attract or encourage unsaved people to surrender to Jesus. To every one of his would-be followers Jesus says, "If you hear Me, pay attention to what I say!" The Blessings of Saying "Bye-Bye"
Just as the weaker king had to surrender to the stronger king, Jesus calls us to surrender to Him in Luke 14:31-33. Notice what He says in v. 33. What do you and I have to give up to Jesus? The words “give up” in the original convey the idea of “saying good-bye to” or "renounce an interest in." The Jewish historian Josephus used the word to describe Queen Esther when she fasted and "renounced her interest in food" so she could pray. Who or what do you need to say good-bye to in your life to follow Jesus wholeheartedly? What hinders you from full commitment to Him? How can you renounce your interest in it? Jesus says we must renounce our interest in everything that belongs to us so that nothing will distract us from following Him. Jesus gives another illustration of counting the cost of following Him in Luke 14:31-32. Think about what He says in that passage: What makes the first king pause before attacking the other king? When might it be proper for an army of 10,000 soldiers to attack an army of 20,000? What does the first king with the smaller army do in Jesus' story? Why? Consider this illustration and apply it your own relationship with Jesus Christ. He’s the King with the superior force, and you and I have no means to oppose Him and be victorious. "Every knee will bow to Him and every mouth confess that Jesus is Lord." What is the wisest course of action we can take in such a situation? What are God’s “terms of peace?” Will you agree to them? 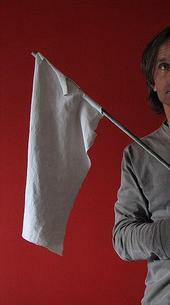 Can there be any conditions to unconditional surrender?